For those who are familiar with DeWalt and their products (and anyone in the industry should be familiar! ), you will know how many great reviews they get and how well known they are at making good quality tool products and gadgets for a wide range of customers. They pride themselves in having a range of home-owner priced products with professional grade finishes and there is such a range of models to choose from, there is definitely something to fit into everyone’s budget. The DeWalt DW735x is one of the most expensive in their range but has a powerful 15 AMP 20,000 RPM motor that can handle larger cuts and wider materials very easily. For those who love getting good quality products that last years and are under warranty for a good length of time, this DeWalt model may be the answer to all your cutting issues. Since the price is quite high for a planer, we would suggest those who are small store or workshops owners should invest or those in the profession as a sole trader. Whilst beginners are welcome to try it and see what they think, for your first planer, this might be a little hard hitting. It has a lot of added and extra features which is perfect but often confusing for someone who doesn’t really know what they’re doing. A great feature of the DW735x model is that it has a two-speed gearbox which allows users to change their feed speed and optimize every cut in terms of the inches they are able to do. The cuts range from 96 to 179 CPI which is impressive for a planer that isn’t typically classed as professional. This feature is on a few different DeWalt models and proves as a great asset to many of the models. Everyone wants their planer to be powerful and durable, their job is to cut materials and ensure for a great result, having a powerful motor ensures this. The powerful 15 AMP, 20,000 RPM motor is able to handle lots of larger and wider materials cutting them with ease. This model also has a 10,000 RPM cutterhead speed, putting it a lot higher in our opinion to the other models available. Having the perfect cut and finish on your material is essential, this is especially true for anyone who is a professional in the industry and needs to provide their customers with a great product. This DeWalt DW735x model produces a perfect finish and is able to cut relatively deeply into materials. The warranty is 3 years which is standard for most DeWalt products, but it is limited which means it comes with specifications and certain clauses such as if you have tried to fix it yourself or someone else has attempted to and the product is damaged due to this, it will not be covered. Similarly, it will not be covered if the damage or fault is due to wear and tear as this is natural for any product. You will be able to claim on the warranty though if it is a to do with the mechanism or faulty materials within the model which is a great safety net. How durable is the DeWalt DW735x? This model is super durable when compared to the other DeWalt DW734 and DW735. This is primarily because of the heavy-duty aspect of the model, and that is very high quality and therefore able to handle most materials, even those that are heavier than normal. Most DeWalt products are suitable for all abilities and we would say that if you’re set on a certain model and it has good reviews then you should try it out. However, this particular model is quite a lot of money and might not be worth purchasing if you’re only a beginner. Those who have been in the profession a lot longer or someone who has general knowledge about having a planer would benefit a lot more from the added features you get with this model. 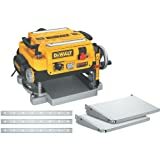 The reason it is more expensive than most other DeWalt planers is that of the extra features, these are harder to use and a beginner might not make use of them meaning they should get a different style that is more suitable for their ability and thus save themselves money. Customer reviews on various websites can give a better overview and opinion of the product you’re looking at and we’ve gone ahead and researched what other customers have been saying about the DeWalt DW735x making sure you have a balanced view of the product itself from the point of view of people who have used and tried it out before. The model performs well and generally has a long shelf life as it is a DeWalt product and they’re known for their quality. It is able to cut even thicker pieces of materials and still work great afterward, and despite being a little extra money than the DW735 model, it is apparently worth every cent. The model features extra tables which are especially handy for those who need it when they have extra material which needs to be propped up or stored somewhere whilst the planer is doing more cutting. However, if the screws aren’t securely placed in the knife (after you have changed it) then this may end in a catastrophe and the end of your planer. The screws are hard to fit into place if you don’t read the instructions properly so whenever you’re changing your knives on the planer, ensure they’re securely in place. Overall, customers have mostly positive reviews and state that this product is worth buying if you’re needing it but obviously the higher price is an issue, however, they suggest that if you want to spend that amount on your new tool then you definitely should. Concluding, this is a well-performing but highly priced product that takes a lot of care and time to set up as well as regular maintenance in order to keep it in shape and doing great things. The knives included with the model are reported to be unacceptable, so it might be worth investing in more when you purchase the model to ensure for a great cut.